With pregnancy, I've tried to deal with cravings the same way I did when I was actively losing weight: substitution. The good thing is that I mostly crave oranges, which we keep in the house at nearly all times. I also crave cottage cheese, for which there is no good substitute, and I try to only have it once a month or so. My main substitution for other foods tends to be Lean Cuisine meals. I've heard a million arguments both for and against their place in weight loss, and all I can say is that this is something that worked well for me. At 345 pounds, I had absolutely no idea what a portion size was, and this helped educate me (there was a lot of seriously?! THAT is 300 calories?). It also helped me avoid binges for a very long time - I had pizza every Friday for lunch and lost 150 pounds in a year. The difference was, I ate a Lean Cuisine pizza and not an entire large delivery pizza. One big argument against these meals is the sodium content. I never really had an issue with that - given a daily sodium goal of 1500-2000 mg, since I had eliminated all restaurant food, a Lean Cuisine for lunch wasn't terrible. And, comparatively, they aren't as bad as folks may think: my favorite meal is chicken in peanut sauce, and it has 550 mg of sodium. That's about the same as six chicken McNuggets (without any sauces or dips), and way more satisfying. Preheat oven to 350°F. Cut chicken into smaller pieces (the Lean Cuisine does chunks but strips worked just as well) and set aside. Dice apples and set aside. Finely chop green beans and carrots (or, for the carrots, use a vegetable peeler to peel them into strips). Sauté until medium-soft. 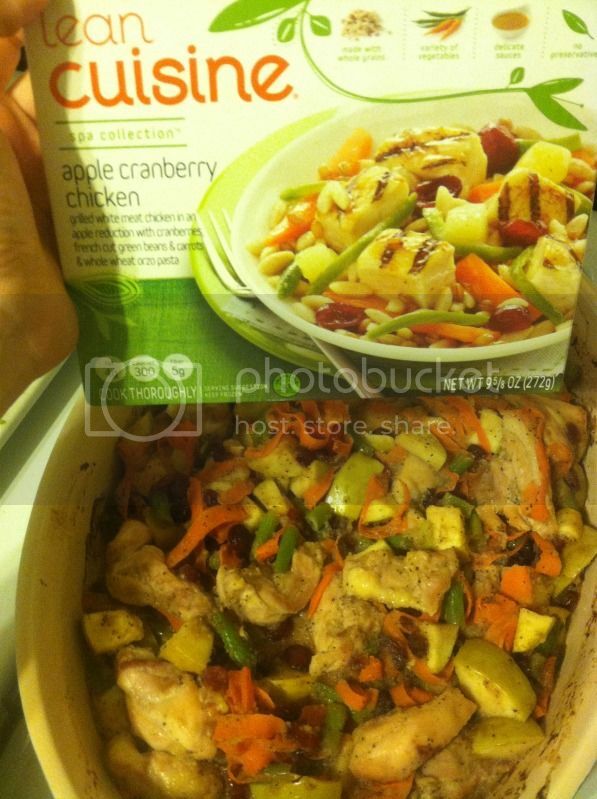 Stir in black pepper, apple sauce, cranberries, diced apple, chicken, then pour mixture into an oven proof baking dish. Bake for 25- 30 minutes or until chicken is cooked through. This is one of Matt's favorite Lean Cuisines, and he loved it. The original recipe didn't include green beans, but I added some because the Lean Cuisine does, and extra veggies never hurt; feel free to add more or fewer based on your own preference! However, I left out the orzo pasta that the frozen version uses, just to save calories and avoid unnecessary processed carbs. The recipe also suggested adding balsamic vinegar, so that could give it an interesting twist. It recommended adding salt to taste, which I skipped because lower sodium was the goal. I used chicken thighs instead of breasts because the midwives recommended that and red meat to get more iron - I don't like thighs or most forms of beef, but I've been trying really hard to obey their dietary orders. What about you? Do you ever try to recreate recipes in order to suit your own dietary needs? Which ones? Sounds delicious, and if Lean Cuisine works for you, then stick with it. I've realized that a lot of our problems come from comparing ourselves to everybody else! Yum! Have you had any trouble with swelling yet? All the sudden my ankles are growing... which is not awesome. So now I'm super aware of the sodium content of everything I'm eating. So sad! And good for you eating chicken. I am still so adverse to chicken it's ridiculous. I can tolerate boneless skinless breast if someone else cooks, but cannot deal with the chicken bones AT ALL! Even now, they still make me queasy. Your remake looks and sounds yummy! That sounds DELICIOUS! I'm going to make that soon. I don't think there is anything wrong with using frozen meals once in a while if you like them and they help you to stay on track! I'm curious as to why you consider cottage cheese a "once a month" item?!? That is a perfectly healthy craving which you can eat on a daily basis if you wanted! A half-cup serving of cottage cheese is only 100 calories (even the whole fat cottage cheese is only 110 calories so there's not a big calorie difference between the low-fat version) and has 14g of protein and 10% the DRV of calcium. As for the subject at hand - I've never been fond of frozen meals. Not just because it's processed - but because I could get more food for the same calories if I made a meal myself. You're doing so great! When I was pregnant I let myself indulge in all the cravings willy nilly, but I was also crazy-stressed and didn't exercise as much control as you have. That's what I've been working on lately, actually, trying to recreate favorite recipes in a healthy way. My latest adventure was meatloaf (made with turkey instead of beef), and it was great! !